Have you ever experienced a coincidence so unique and perfectly timed that you’re convinced Spirit orchestrated the whole thing, just to send you a message? To feel her grandmother’s presence, to believe she was being helped from the other side by a woman who had loved and nurtured her is not crazy. Not at all. I have heard so many stories of perfectly timed voicemails, people who appear in our lives just when we need them, a song with just the right lyrics that help answer a difficult question. These experiences are too powerful to be mere coincidence. They are moments of synchronicity that bring comfort in times of pain and guidance in times of uncertainty. They are the signposts that help us know we are on the right path or help steer us onto a new one. We just need to open our eyes, and our hearts, to hear the message and receive the gift. A friend once shared her own experience with learning to see and appreciate synchronicity in her own life. She started a practice of writing down three miracles a day. “When I first heard this suggestion, I thought it was crazy,” she told me. “Miracles were things that happen to saints, not to ordinary people.” She mocked the exercise at first. “I got the great parking spot right in front of Walmart,” she said. Miracle. But even that simple example helped open her eyes. In a sad moment, she saw a butterfly flit by. “It felt as though the universe were saying hello.” Miracle. Then, she had an unexpected expense followed immediately by an unexpected opportunity for extra money. Miracle. “Now, I see miracles everywhere,” she said. Many people would dismiss these experiences as coincidence and miss the opportunity to feel the connectedness. Our loved ones are there, and they want to help us. Miracle, synchronicity, the touch of a hand from the other side. When our hearts are open, and we are willing to change our perspective, the universe conspires to help us along the journey. If you want to work on changing your perspective, so you can start seeing coincidence as loving guidance, I encourage you to try my friend’s exercise. Write down three miracles a day and see what happens. Thank you so much for helping others. I feel my husband tries to contact me since his passing on Oct 18 2017. How do i know it’s real or just my wishes and imagination? I love this story. I wish I could experience this kind of things too. I wish I could hear my Mom she passed away 3 years ago. I miss her so much. Thank you for post. It is miracle #1 for me today. I do believe there are messages from beloved family and friends in answers of prayers. Today I know I had one from Heaven when I went to the cemetery to see my dad’s WWII marker that was just put in place. He passed away March 6, 2018 at age 99. He would of been 100 years this month. His favorite flower was the Mayflower and I would pick him a small bunch from my Mayflower bush every year so he could smell the strong fragrance. Today to my surprise the wild Mayflowers blooming over the family cemetery lot, especially around his marker. I haven’t seen the Mayflowers over there since I was a child and I am now 70. Dad also loved the sky and clouds and they have been beautiful lately. I will begin to try this exercise sounds great. love to meet you one day it is a goal of mine Thank you I get it and please keep doing what your doing Im proud of you so young and smart and able to create family reunions. I was really moved reading about the women’s story. I myself have had some questionable moments. When I was nine I lost my dad to a family genetic disease. My mom was alone with eight kids for five years but when he died she had a break down a year later. I was leaving to stay with my older sister for a few weeks and when I said goodbye to my mom I remember her facing the wall, her back to the door. The room felt heavy, sad, and broken hearted. As I stood in the doorway, I swear someone tugged my wind breaker! I turned around and there was no one there! No people, no pets, just me and my mom. I knew my dad was there in that room with her. My mother passed away 7 months ago and one sister was in charge of everything. She said she owns the house now and is not probating the will as there is no money. I walked away quietly. I keep my dad’s and brothers picture in my csr. They kept falling on the floor I asked them what are you trying to tell me. At the end of that week I receive a document from the sister to sign this to release all my rights to the estate with a post it note from her stating she money for mother’s care and I had to sign this. I said no way and contacted a lawyer all of the siblings own the house. My dad and brother were warning me of her shady ways! Now she has to probate the will and I asked for a copy of the will we all split personal belongings 20 percent to five of my siblings! I believe!! Once I started trusting the wonderful signs around me… they came more often. I find that when sadness gets the best of me it tends to cloud the signs. I try hard to stay positive best I can ❤️❤️ Tough sometimes. Wow! Two truly Beautiful stories. I love the way that loved ones who have passed on help to protect us as we walk our path here on earth. It’s So comforting to know that they are so close to us. I actually believe that they are closer to us on the other side then they were while incarnated here on earth. I too, have received these amazing gifts from my loved ones that have passed. I feel beyond grateful for these experiences. Which leads me to the second story. The more we feel appreciation for the miracles that are sent our way; the more the universe sprinkles them on us. Life here on earth is truly magical. All we have to do is open our eye and hearts, and Bam! Hi Matt I keep seeing times on the clock that have a 4 or 3 consecutive numbers, and I feel they are from my son. I also see butterflies that come and go. When they are around they fly around me . I just think my my son comes around me. Well…….this was my miracle tonight. I am really having a tough time again lately. If I could just stay in bed I would. Anyway thank you so much this email came at a great time. I will start the exercise tomorrow. It’s funny you sent me this email ever since we came to see you at Villa Louisa with my husband little things in our lives are changing to the way you are describing. We ate the couple that you told my husband he was tall and his father passed little Italian man you said we forgot his underwear. I pray you remember. Cause I was the one that really wanted to bring my husband and so prayed that his dad would come. My Mom has been gone but I haven’t had the pleasure . Anyway thank you for that night and for this. I will start. I also wrote you a letter telling you about me. I too have experienced miracles to share. My grandson, who was six months old at the time was strapped in his car seat riding in his dad’s pickup truck which was loaded with power tools, etc when a tire blew. His Dad lost control of the vehicle, and it crossed the highway, rolling over several times. His Dad was ejected and suffered serious injuries but although all those tools were thrown around the backseat where the baby was seated, my grandson did not substain even one scratch. His diaper was filled with broken glass, but again, not even a scratch! I believe his guardian angel, or my husband, held him firmly and protected him. On several occasions I have felt his presence and know he is watching over us with love. My eldest son also passed suddenly two years ago, and sadly I have not had the heartwarming experience of his presence. I pray that one day I will sense that he is okay in his new life beyond. I wish you would come to manhattan so I could see you. 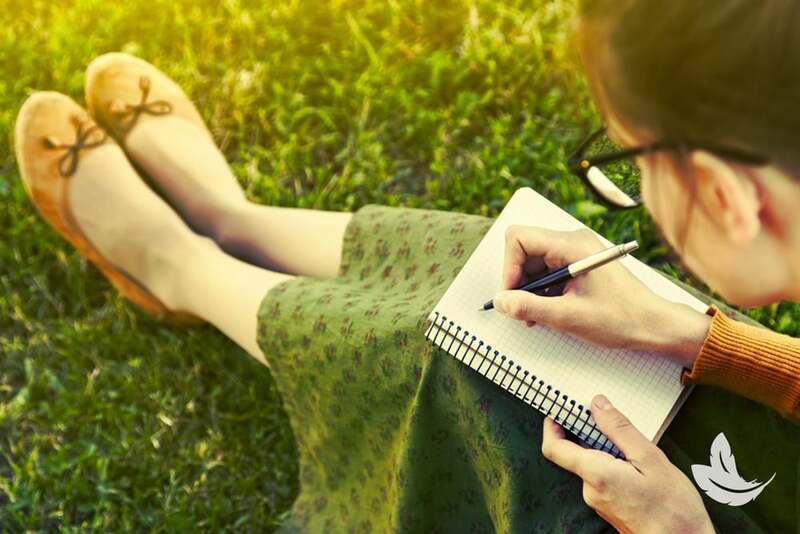 Many years ago when I started journaling I started a similar exercise. At the end of each journal entry I would write 5 things I was grateful for that day. They are as simple as the sun was out today, to I saw a shooting star when I was talking to gram in Heaven, to an I love you from my boys without me saying it first. To go back and read the ones from many years ago to today is just lovely. This is an amazing story and I believe it was her late grandmother giving her the strength to leave her abusive husband. I would love to do this exercise, but I am not sure if you mean write down miracles you want to happen to you, or the ones that have already happened? That was so nice. Thank you for sharing. I definitely believe in signs from spirit. I truly believe in signs from the other side. I talk to my angels all the time. It brings me comfort. Lovely experience. I, too, am a believer. Many times I’ve had the extreme pleasure of getting messages and pre-cognitive dreams that always came about on the exact date given me. Thank you Matt for all you do to help people. My guy, Bill, passed away Feb 13, 2018. Does he have any message for me? His passing was a shock to all of us. Will he be with me forever? Both my parents had passed…Mom-1991, Dad-1999. It was 1/18/2008…my 53rd birthday. I was driving down a two lane road…beautiful sunny day…going to celebrate my birthday at a friend’s house. I look ahead down my side of the road…and I see two white butterflies coming toward my car. One was a little bigger than the other. Without flying up higher… they fluttered over the hood….and when they were eye-level with me…they crossed over each other…and went up over my roof. I glanced in my rear-view mirror…and saw that they had went back to their original ‘level’…and just continued along up the road. I knew right away it was my parents wishing me ‘Happy Birthday’ from Heaven. Thank you Matt for reaching out via email..I have always been an intuitive sensitive..with a strong faith background. two years ago lost my beloved son the baby of family at 26. He left 3 small kids behind with their Mom. It was devastating for all of us-very sudden Cancer only lived 6 months. My son was raised in a house with 4 sisters also gifted where we meditated prayed and always discussed life after death. communication and signs are important to me as it brings great comfort from other side of the veil. I have seen you on TV many times and see you book at Foxwoods Casino-I can never get a ticket..you are fantastic..but my son led me to another gifted empath Patty Griffin. Love never dies we never die only transition..God Bless your gifts You guys are human angels sent to teach us those lessons. I have spoken to my son many times. I enjoy people finding their loved one is still with them . I lost my wife 2 years ago after we fought her heart problem for 26 years married 35 years she is my one and only love. I think she has contacted me but not positive wish that Matt was available sooner it looks like months I would really like to know. In 2010 my sister died in my arms. She had just turned 46, I was 60. I put in a garden for her and placed a yellow rose tree in it as she loved them. Just about every day I talk to her. In 2012 I asked her to send me a sign if she heard me. It wasn’t long after that I stopped right where I stood and my jaw dropped. In the middle of the yellow rose tree was one red rose.. she hated red roses!! Since then, I have gotten at least 1 red rose every year and last year I had 3 at one time. I have a picture of this for those who do not believe. For me, I know it’s her and it made me smile. I have signs from my daughter almost daily! Feathers, coins, dragonflies, red birds (cardinals)…I encourage everyone to open their minds and hearts because those signs ARE there! I’ve had some very right ‘on-spot’ messages too but too long to type here. Blessings to you all my brothers and sisters in Christ! Thank you for this sharing this. I will write down 3 miracles a day. I have been looking for my sister for over 20 years. I was only 3 when she was born and I was told my mother left her at the hospital. My parents were separated at that time and my mom was with another guy. I am an afro American female and my sister is biracial. My mom died in 1991 and my dad in 1987. So…I found out about my sister after both of my parents were gone! I have been receiving signs from my dad only a few months now. I acknowledge them and thank him. I just dont know where to look for her. I have her birth name and date. I requested my mothers medical records from the hospital she had my sister at in 2007/8. The records I received didnt have any record of my mom having a baby! I went back again about 2 months ago and requested her records again…and there it was!!! I dont see 11:11, or any repeating numbers, I dont see feathers either. What I see is my dad doing things in my apartment. I do write down everything that occurs. I hope one day I will find my sister and I hope she is open to meeting me. This is so very interesting & emotional. For those of us who have lost close people this helps us to understanding what lies ahead. God Bless You Matt & Thank you for sharing.